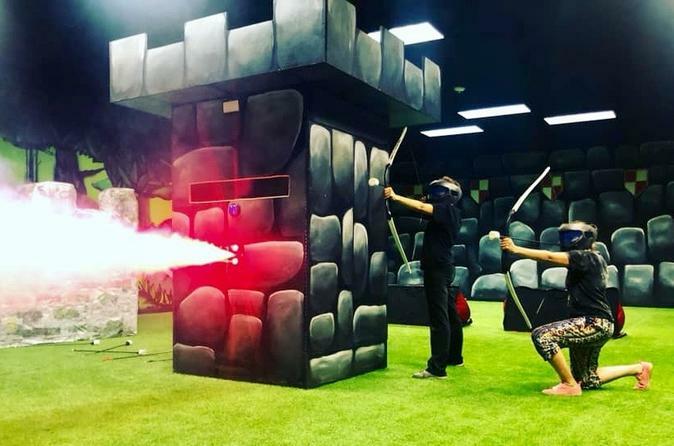 The Home of Archery Tag in Las Vegas - a fun and unique way for people of all ages to come together to enjoy archery. It is a unique sport that combines elements of dodgeball with the timeless skills of archery. Players take aim at each other with our soft arrows to score points or eliminate opposing team members. Our Archery Tag® 5-Spot Knock-Out Target adds an exciting dimension to game playTag combines dodge ball with archery in a game where you get to shoot your friends with a bow and arrow! It is safe and a ton of fun! With bows in hand, players arm themselves with foam-tipped arrows and try to eliminate players on the opposing team before time runs out. During each game, players run, dodge, and shoot these nerf-like projectiles at each other until all players on one side are eliminated. When you arrive for your Archery Tag Adventure you’ll be greeted by your host, given a short tour and safety briefing, and everything you need to have a memorable experience. We are located inside the Boulevard Mall with our own entrance just minutes from the Las Vegas Strip, Downtown Las Vegas, and Henderson. Our brand new facility has plenty of free parking, clean facilities, snacks and beverages and is free of smoke and crowds. It is an easy ride from any Las Vegas location via private car, cab, or rideshare and private bus transportation will find it easy to drop off and pick up guests. We are designed specifically for families, couples, groups, corporate events, and bachelor and bachelorette parties who want to enjoy the most fun and well designed escape room challenges in Las Vegas.